Montana Hooch Booch Kombucha starts its life out as a sweet tea made from our hand selected organic green and black tea and organic cane sugar. We then add a live culture called a SCOBY and the fermentation process begins. The resulting product is a slightly fizzy, deliciously flavored drink that has very little remaining sugar and caffeine, and is instead full of a host of wellness boosting goodies like vitamins B & C, antioxidants, organic acids, enzymes and pre and pro biotics. We flavor our Kombucha with fresh organic flavor extracts that contain little to no additional sugar. Our unique flavor profiles are touted as easy to drink and palatable. Drink them on their own or add them to your favorite alcoholic beverage as a healthy alternative to an artificially flavored and sugary mixer. 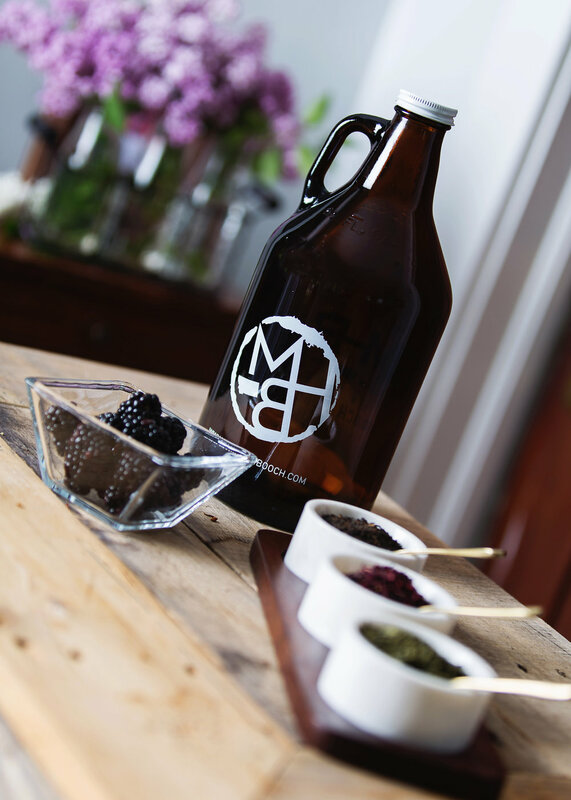 Our healthy Kombucha pairs great with Moscow mules, martini’s, mixed drinks or add them to your favorite craft beer, wine or champagne. We’re just two Montana girls with a dream to deliver a tasty and healthy Kombucha experience to our local community, one drink at a time. Our Kombucha starts its life out as a sweet tea made from our hand selected organic green and black tea and organic cane sugar. We then add a live culture called a SCOBY and the fermentation process begins. The resulting product is a slightly fizzy deliciously flavored drink that has very little remaining sugar and caffeine, and is instead full of a host of wellness boosting goodies like vitamin B & C, antioxidants, organic acids, enzymes and pre and pro biotics. SCOBY is an acronym for “Symbiotic Colony of Bacteria and Yeast”. The SCOBY colony eats the sugar and ferments the tea mixture. We flavor our Kombucha with fresh organic flavor extracts that contain little to no additional sugar. Don’t be alarmed if you find a floaty thing or stringy thing in your glass of Kombucha. We use natural live cultures and these are just traces of those cultures left behind in the packaging process. In fact, it’s a good sign that the booch you're drinking hasn’t been pasteurized and has indeed been through the fermentation process with a live culture. Kombucha has been naturally decaffeinated through the fermentation process. While it’s not caffeine free it does have just 8-14 mg of caffeine per 8 oz serving.